Changing a go kart tire is easy. 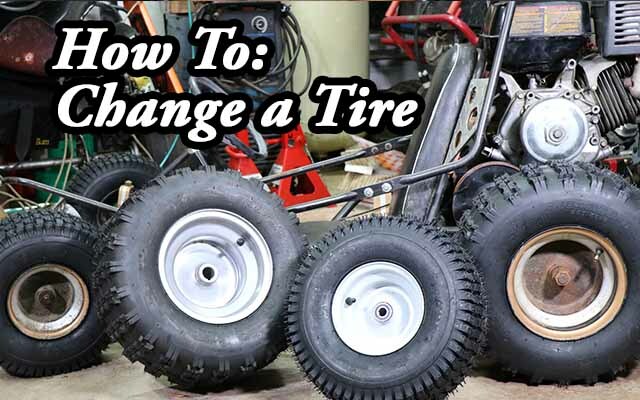 This guide will show you how to remove and replace the tires on your go kart, ATV, or golf cart rims. Let's get started! Often, people ask me if any specialized tools are required to change a go kart tire. The short answer is: no (just some elbow grease). 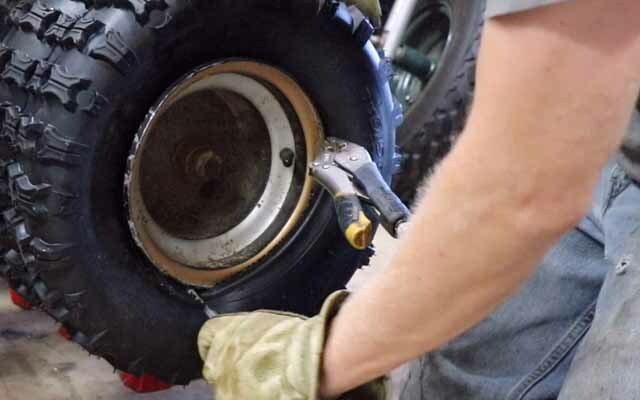 Most smaller ATV, golf cart, and go kart tires can be removed with just a few simple tools that you may already have hanging out in your garage. When selecting tires to replace your old ones, just look on the sidewall of the tires you already have. This number should be the one you search for to match your rim. 22 X 11.00 – 8 this tire is 22″ in diameter, 11″ wide, and fits on an 8″ rim. 145/70-6 this tire is 145 mm wide, 70% of its width is the distance between the rim and the tread (aspect ratio) and it fits on 6″ rims. 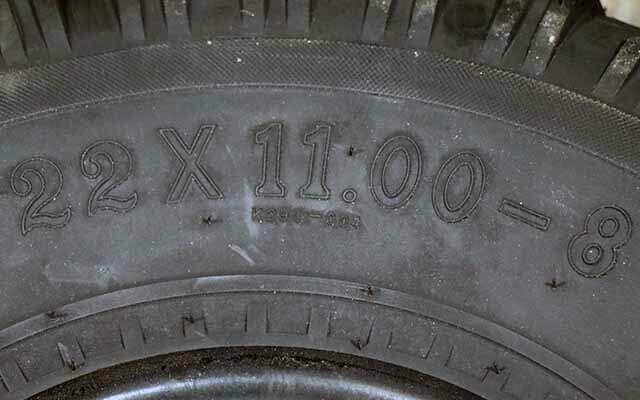 FYI: the diameter of this tire is 14″, which can be calculated by multiplying 145mm by .7, multiplying that figure by two, converting it to inches, then adding the rim diameter to that figure. Breaking the bead from the rim, especially on old, crusty tires, could be a chore. The bead is the innermost portion of the tire that is actually steel wires, which are covered in rubber. 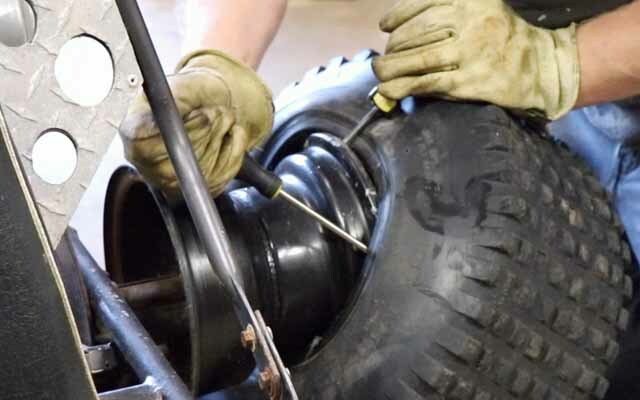 Breaking the bead means that this rubber coated steel ring becomes separated from the rim itself, allowing you to remove the tire from the rim. First, you should let all the air out of the tire, which can be accomplished by removing the valve from the stem with your 4-way valve tool. Next, you should mix a little dish-soap and water together, then pour it on the area where the rim and bead are touching. As you work around the bead pushing down with a pry tool or screwdriver, the dish-soap mixture will flow into the space, lubricating the bead and rim for easier tire removal. You may have to press down on the bead in a few areas around the rim edge before the bead will break free from the rim. If you are having a lot of trouble with breaking the bead, you can always get a tire changing tool, which gives you the extra leverage to separate the tire from the rim. De-mounting the tire from the rim only requires a few pry tools, and proper positioning of the bead on the rim. 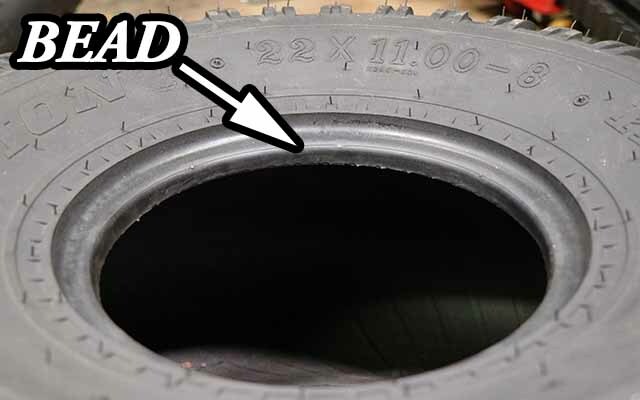 Press the bead toward the middle of the rim with your knee or hand, which will allow a small space on the opposite side of the tire to open up, where you will insert your pry tool or screwdriver to begin pushing the bead over the exterior edge of the rim. Work additional pry tools under the bead, working in a circular fashion until the bead pops off of the rim. You are now halfway finished with removing the tire from the rim. Next, you position the remaining tire bead toward the thinnest (center portion) of the rim, while simultaneously prying the opposite end of the tire bead off of the rim. If you do it right, the bead will pop off relatively easily. If you fail to position the bead on the narrow portion of the rim, there will not be enough space to allow the bead to slip off of the exterior portion of the rim. I recommend replacing the tubeless rubber snap-in valve for one piece rims every time you replace your tires. Why is that? Well, valve stems are made of rubber, and rot just like tires do. 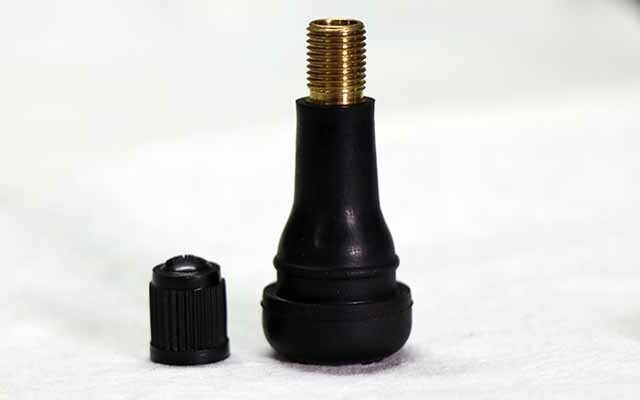 Additionally, the valve inside the stem can corrode and eventually fail. Replacing the valve stem requires breaking the bead, so why not replace the valve stem while you have the tire off? It will save you time and effort in the future, and will give you piece of mind knowing that you have the proper seal for your one piece rims. Most tubeless valve stems are snap-in style valves, which need to be cut from the base and pulled out of the rim. A pair of side cutters makes quick work of the valve stem. Next, partially insert the new snap-in valve stem into the rim hole, then screw the 4-way valve tool onto the stem threads. You can now pull on the 4-way tool, which will allow the rubber stem to ‘snap’ into place on the rim. Mounting new tires to rims is basically the opposite of removal. Start by lubricating the edge of the rim and tire bead with a mixture of water and dish-soap. Next, push the tire bead over one edge of the rim. For smaller tires, the bead can be pushed over by hand. For larger tires, you may need to position the bead on the narrow portion of the rim, then use a pry tool 180 degrees opposite of the bead to allow the tire to slip onto the rim. Once you have the the first half of the tire bead mounted to the rim, take your locking pliers, and clamp them down to the rim edge. The locking pliers will act as a second hand to prevent the tire bead from rotating off of the rim while you use the pry tools to work the bead over the edge of the rim. As previously mentioned, please make sure you push the bead over to the narrowest cross section of the rim, which will allow the rest of the tire bead to easily slip onto the rim. You are almost finished with your new tire installation, but a major obstacle still remains: seating the tire bead to the rim. With all of these methods, you will need to remove the valve core first, then apply compressed air through a compressed air nozzle. Simply apply compressed air to the open valve stem until you hear the bead ‘pop’ twice. The popping sound is when the bead is pushed onto the rim, locking the tire in place. For larger tires, the bead may not touch the rim, so you can tie a loop in a rope, and pull on the rope to help force the bead outward against the rim. While you pull on the rope, apply compressed air to the open valve stem until the bead pops into place on both sides of the rim. If all else fails, spray a small squirt of starter fluid to the interior of the rim with the tire roughly in position. Use a BBQ lighter (keeping fingers away from the rim, having a compressed air nozzle in the other hand) light the starter fluid by the edge of the rim. The expanding flame and gas will almost immediately pop the bead into place, and the tire will start to deflate very fast. 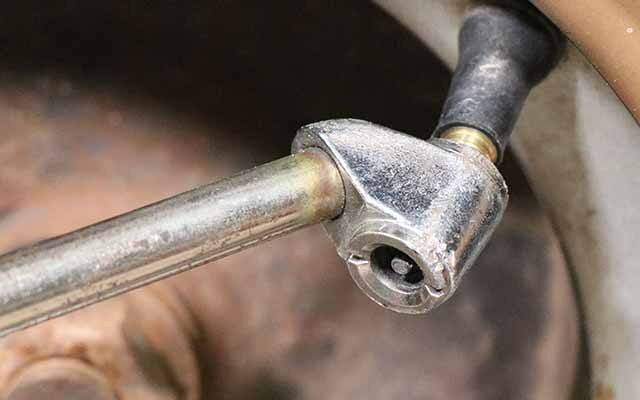 Quickly apply compressed air to the open valve stem, which will prevent the bead from breaking loose again. This method works very well for me, but should be done with caution. If you are at your wits end, you can always take your tire to a shop, where they can professionally inflate it. 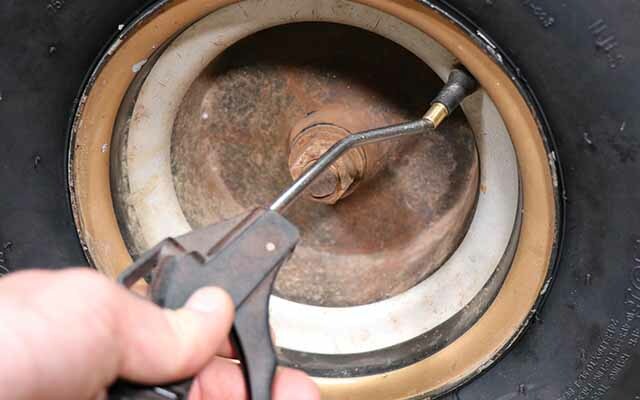 After you have the tire bead seated on both sides of the rim, simply reinstall the valve core, and inflate the tire. Make sure you read the side-wall of the tire for PSI inflation settings. For most go kart, ATV, and golf carts, low pressure tires should be inflated from four to ten PSI. Congratulations! Now that you have installed your new tires, you can enjoy them driving around at your favorite riding spot. If you like this maintenance tip, please like it, comment below, and share it! Need other maintenance tips for your go kart? 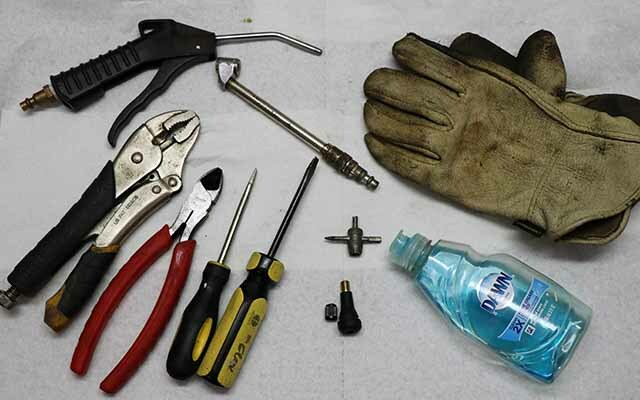 Check out the go kart maintenance tips and tricks section. Hey, kartfab. I have I have two 11-7.00-5′ burris tires I would love to put on my kart; however I don’t know the specs for the rims that go on this size tires. Can you help? I’m referring to the width size of the rim that would be ideal for this tire. Do you recommend taking the wheels off the karts to change the tires or Is it just extra work ? Seems like the wheels are put on really well. What’s the best pressure for the wheel/tire combo you use on the go cart build? The sidewall says 24 psi max but that has to be WAAAY too much. They came from GoPowerSports with about 9-10psi in them. Thanks much!!! 10 psi sounds about right. 24 psi is probably to seat the bead. Somebody just gave me an old yerf dog. It didn’t have any front tires so I’m not sure of the tire size. It seems to be a 6” rim that has a width of 4”. I can’t find 4” width tires. Does the tire stick out a lot further than the rim? Would I get a 145mm width tire? Any help would be appreciated. 145/70-6 tire or 15×6-6 tire would be a good start. Im personally a fan of the 15×6-6 turf savers on the yerf dogs, as that is what they had stock. Good, solid tires. Hey, how do i remove the wheel from the back axle? It seems to be stuck even after removing the nut. I have watched alot of videos, but i can’t find any that shows how to remove it. I know it has a keyway and a key in there, but i don’t know how to get it out. Its very rusty too. Any help you can provide me will greatly be appreciated man. you take an awl/punch like you would use to start a drill bit hole, then you put it against the key and try to move the key by smacking the awl with a hammer. Spray some pb blaster rust penetrating lubricant on it as well. would a nail work? or do you think i should use awl/punch? Hi, I’m having the same problem. Would like to Know how and if you were able to do it?